There are different ways to move a card to a different position or a board. Click on the closed card view and drag and drop it to the selected position/column. Using this option, you can define the exact position of the card in the new column. Right-click on the card to open the Context menu -> select Move. Use the Left and Right arrows to move the cards from a column to column. (Direction: left-to-right and right-to-left). Use the Up, Down, Top and Bottom arrows to move cards within the same cell. This way you can easily define the preferred card position. To move a card to a different board, click on: Move to and select the desired board from the Board menu. Once you select the board then a new menu opens up. Use the dropdown list to define the column and the swimlane, where you want to place your card. You have two options: to preserve the card details or to customize them. Select "Move card" to move your card to the desired position. The custom fields are: card assignee; type; size and tag. Open the card and move it through the Position Control view located at its bottom. It mirrors the workflow stages of the board where the selected card is currently located. All stages that cards have already passed through are colored in grey. Users can easily identify the current position of the card - it is marked with the icon matching the color of the stage. You can click on any of the stages -> just update your card and it will be immediately moved to the desired position. 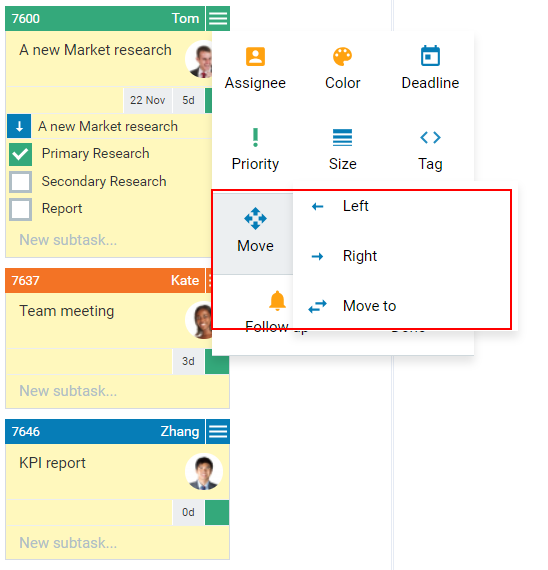 Click on the arrow icon located left to the Position Control to expand/collapse the Board and Swimlane control. To move the card in a different board -> use the In Board link to select the new board and the card position via the minimap. To move the card in a different swimlane on the same board -> use the Swimlane link and define the lane. 4. How to Move Multiple Cards? Select multiple cards with the mouse selection rectangle. The selected cards will be colored in yellow. Click on any of the cards in the rectangle to drag and drop the bunch of cards to the desired position. The small number at the top left side of the cards displays the number of cards that you move in bulk. Select multiple cards with the mouse selection rectangle -> click on the Context menu of any of the selected cards and choose Move. The available options for moving multiple cards are Left, Right and Move To a new board.